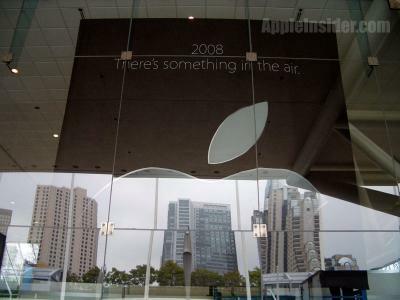 Another Macworld is just days away and the rumours are flying. Who knows what Steve has up his mock turtleneck sleeve. It ain’t a Mac Pro (they announced the awesome 8-core beast last week), and it sure isn’t a Bermuda-ready iPhone (sniff …). Like MacRumours and others, Breezeblog is hoping for an ultralight touch screen laptop. But judging from the banners around the Moscone Centre venue in San Francisco, something major in the wireless/phone arena may be on the cards.